Cezanne, the most restless and enquiring of modern artists, is difficult to classify. Initially associated with Impressionism, and a participant in two of the early Impressionist Exhibitions in Paris during the mid-1870s, he got to know Monet (1840-1926), Renoir (1841-1919), Pissarro (1830-1903) and Alfred Sisley (1839-99). However, he gradually lost interest in reproducing momentary observations and began to focus on what may be called a type of 'abbreviated Impressionism'. In this more formal and constructive approach, he simplified and concentrated colours, and standardized his brushstrokes so as to turn them into units in a pictorial structure. He also relied more and more upon the use of geometric motifs. (In a letter to the artist Emile Bernard, written in 1904, Cezanne stated that nature was best depicted in terms of three-dimensional geometric shapes, such as the cylinder, the sphere and the cone.) Irrespective of how his painting is categorized, he was undoubtedly one of the best landscape artists of the late 19th century. In his attempt to create a more intellectual, design-oriented style of painting, he often returned to the same subject time and time again. Examples include numerous still life paintings of fruit on a white tablecloth, and landscapes of Mont Sainte-Victoire. Cezanne's was a rough and daring form of modern art which remained largely incomprehensible to the general public, but was highly influential on other modernists, like Pablo Picasso (1881-1973) and Georges Braque (1882-1963), and on early abstract art of the 20th century. NOTE: For the background to French Impressionism and the group of young artists involved in it, see our 10-part series, beginning with: Impressionism: Origins, Influences. Montagne Sainte-Victoire is a limestone mountain in the south of France, overlooking Aix-en-Provence. It already possessed a symbolic appeal in the region, being linked to an ancient Roman victory and several early Christian festivals. Meanwhile, its distinctive silhouette greeted Cezanne every day when he was at the family home at Le Jas de Bouffan, and - along with views of the old Bibemus quarry - it became one of his favourite landscape subjects, which he painted over and over until his death. He started painting it around 1882, although it was only one of several elements in the overall composition. From about 1886 onwards, however, it began to dominate his paintings of Provence. Sometimes he would incorporate a view of the nearby railway viaduct: see, for instance, Mont Sainte-Victoire and the Viaduct of the Arc River Valley (1882-5, Metropolitan Museum of Art, New York). At other times he would paint it as seen from a favourite spot: see, for example, Mont Sainte-Victoire View from the Grove of Chateau Noir (1894, Edsel & Eleanor Ford House) and Mont Sainte-Victoire seen from Bibemus Quarry (1898-1900, Baltimore Museum of Art). 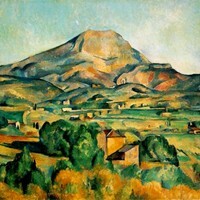 During Cezanne's final years (1902-6) he completed a final series of the mountain, seen from the north, in his new art studio on the Chemin des Lauves. Cezanne's modernist painting technique is clearly evident in these famous landscape paintings of his beloved Provence. Without abandoning the optical realism of Impressionism, he tries to bring a certain order and clarity to nature by using simplified shapes - triangles, flat planes, cylinders, rhomboids and the like. For example, in the 1887 landscape of Mont Sainte-Victoire in London's Courtauld Gallery, the viewer's eye is led from cubic farmhouses, across rectangular fields, upwards to the conical mountain. As well as geometric motifs, Cezanne has two special uses for colour - namely, to create atmosphere and to represent the depth of objects. He also uses layers of paint to build up a set of horizontal planes that draw the eye into the picture. Unlike other Impressionist painters who typically used shimmering colours, no outlines and applied the paint using thick, short dabs of the paintbrush, Cezanne preferred blocks of strong colour, outlining forms such as tree trunks and fields in dark blue. The effect of every brushstroke was carefully allowed for - he used horizontal lines to create breadth and vertical ones to suggest depth. In some respects, almost every mature painting by Cezanne is a miniature study of form and colour in his continual quest to create something of lasting merit. In particular, his deconstruction of nature into fundamental units anticipates the experiments with form. perception and space carried out under Cubism a few years after his death. In 1907, the Salon d'Automne staged a huge retrospective in his honour. Edsel & Eleanor Ford House. Nelson-Atkins Museum of Art, Kansas City MO.  Chemin de la Machine, Louveciennes (1873) by Alfred Sisley.  The Bridge at Maincy (1879) by Paul Cezanne.